Forklifts only account for one percent of all factory related injuries, but nearly 100,000 workers are involved in a forklift accident per year. Approximately 35,000 of these accidents result in serious injuries. According to OSHA, 70 percent of all forklift incidents in the United States could be avoided with proper safety training and policy. 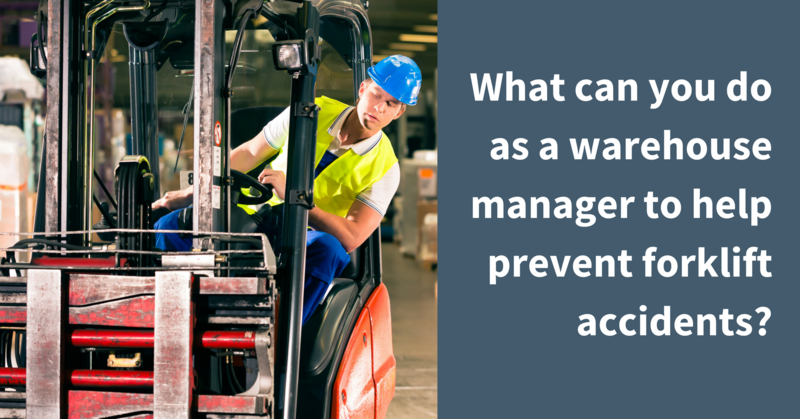 What can you do as a warehouse manager to help prevent forklift accidents? Forklifts can weigh up to 9,000 pounds, which is about three times as heavy as most cars. Most forklifts can travel up to 18 miles per hour. Unlike cars, they only have brakes in the front. This makes it more difficult to stop them. In busy warehouses, you should set a forklift speed limit and make sure your managers enforce it. Determine speed limits for the different areas of your warehouse and post the speed limits as a reminder for your employees. The sounds of welding, machinery, moving vehicles and busy workers make warehouses a very noisy place to work. Workers sometimes wear headsets, earphones or earmuffs to protect their ears from the day-to-day loudness. Because of the noise level, it can be difficult to hear forklifts coming, or to hear pedestrian voices. Integrate a traffic light system with warehouse doorways. Color LED lights will warn both pedestrians and forklift operators when the coast is clear or when not to enter a certain area. Establish a traffic layout and plan for the warehouse, so workers know exactly where forklifts will be coming, and can be on the lookout. Maintenance is important for any machine, forklifts included. Make a maintenance upkeep schedule and stick to the plan. Doing regular maintenance checks on forklifts will help you avoid mechanical errors which can result in accidents. Inspect them daily to make sure all parts are in working order. This will also reduce repair costs as you will be able to catch mechanical issues early. Forklifts are serious machines and they must be handled with caution. Abide by these best practices to avoid accidents and keep your workplace safe!